ANTONINUS, (Third Century), a soldier martyred near Piacenza in Emilia-Romagna in present-day Italy. There are sources which claim he was a soldier of the Theban Legion (22nd September), though this theory doesn’t show up until several centuries after his martyrdom, and it is not mentioned in Martyrologium Hieronymianum , or any contemporary Lives. St. Antoninus is the patron saint of Piacenza, and namesake of the Basilica of Sant'Antonino in Piacenza. A phial of blood said to be his, has been known to miraculously liquefy like that of St. Januarius (19th September). St. Antoninus has been sometimes confused with the sixth century pilgrim to the Holy Land and author of an Itineraria on that journey known as Antoninus of Piacenza, or the Anonymous Pilgrim of Piacenza. ENGHENEDL, (Seventh Century), a church in Anglesey (Ynys Môn), Wales is dedicated to this native Welsh saint. There is no further information on him extant. HONORIUS of CANTERBURY, St. Honorius was a monk at the monastery of St. Gregory the Dialogist (3rd September) in his native Rome when he was selected to be a member of St. Augustine’s (27th May) mission to the Anglo-Saxons. St. Honorius succeeded St. Justus (10th November) as the fifth Archbishop of Canterbury. As Archbishop, he consecrated St. Ithamar (10th June), the first native English bishop, for the See of Rochester. St. Honorius reposed in 653, the last of the Gregorian missionaries. He was buried at the Church of St. Augustine’s in Canterbury. His relics were translated in 1091 to a new tomb, and at about this time a Life was written by Goscelin of Canterbury. JEROME, Eusebius Hieronymus Sophronius was born at Stridon in Dalmatia. After studying in Rome, he travelled in Italy and Gaul, lived as a hermit for about five years in the Holy Land. He returned to Rome where he was ordained to the priesthood and served as an assistant to Pope St. Damasus (11th December). Following the repose of St. Damasus, St. Jerome returned to the Holy Land, settling in Bethlehem, where he founded several monasteries which were headed by St. Paula (26 January) and then her daughter St. Eustochium (28 September). He spent the rest of his life in Bethlehem working on the Vulgate Bible and writing commentaries on the Holy Scriptures. St. Jerome reposed in 420. LAURUS (LERY), (Seventh Century), one of the Breton saints who more or less Christianised Brittany. St. Laurus also founded a monastery in the area that is now known as Saint-Léry. 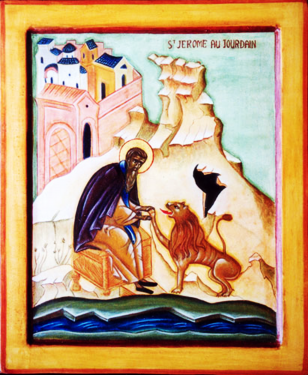 LEOPARDUS, a slave-servant in the household of Julian the Apostate, who was martyred, it is believed, in Rome in 362. MIDAN (NIDAN), although no reliable information on St. Midan survives, it is believed he lived in Anglesey (Ynys Môn) in Wales and reposed in the early part of the seventh century. 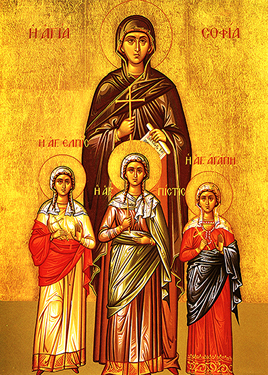 SOPHIA, the mother of virgin-martyrs Faith, Hope, and Charity (1st August who were martyred during the reign of Hadrian (r. 117 – 138). She was permitted to take their bodies for burial, and then prayed at their graves for three days until she reposed, circa 173. TANCRED, TORTHRED, and TOVA, according to the Croyland Chronicle , SS. Tancred, Torthred (men) and Tova (a woman) were among those martyred by the Danes at Thorney Abbey in Cambridgeshire, England in 870. Their relics were included in those translated to Winchester by St. Ethelwold (1st August) in the tenth century. Nothing else is known about these martyrs. URSUS and VICTOR, St. Ursus was a soldier in the Theban Legion (22nd September) who reposed circa 286. His name has been listed together with St. Victor, also a soldier in the Theban Legion, in the Roman Martyrology since early times.